The Right to Peaceful Protest must be Guaranteed if Peace-building is to be sustainable. On 5 October 2017 in Tumaco, on the Pacific Coast, local organisations are reporting nine peasant farmers were killed and 18 injured; the Human Rights Ombudsman has so far confirmed six dead. This violence was allegedly perpetrated by the Colombian Police (ESMAD) against the local peasant farming communities of Alto Mira and Frontera. According to information from the communities they had been “…protesting peacefully… calling for the fulfillment of the agreements made in Havana with respect to point 4” (substitution of illicit crops). ABColombia calls for the Government to ensure a full investigation into killing of between six and nine peasant farmers and 18 injured from the communities of Alto Mira y Frontera, allegedly by members of the Colombian Police Force. ABColombia also expresses its grave concern at the report on 8 October 2017 that the Colombian anti-narcotics and riot (ESMAD) divisions of the police attacked the Humanitarian Verification Mission, who had gone to verify the facts. This happened despite authorities being previously informed and kept informed throughout of the Humanitarian Verification Mission. According to reports there were two sets of shots aimed at the Mission the second after they had identified themselves. The Mission consisted of National NGOs, local Government Officials the Catholic Dioceses of Tumaco and Inter-governmental organisations. Some of the organisations on this Humanitarian Verification Mission are partners of ABColombia members. ABColombia also urges the government to facilitate dialogue with peasant farmers, Afro-Colombians and Indigenous Peoples regarding how to implement the voluntary illicit crop substitution programme, and especially in areas where armed illegal actors have invested interests. There is little State presence in Alto Mira y Frontera, communities are extremely poor and they are living in a highly tense situation with various illegal armed groups present, including those trafficking drugs, struggling for territorial control. Some of these illegal armed groups have also intensified their efforts to recruit young people, they abuse and intimidate the community leaders and other inhabitants. All of which have been reported to the local authorities. This has caused the forced displacement or confinement of hundreds of families and terror. At present, we as a governing body are threatened because we have taken a determined stand to defend life, autonomy and development of our peoples, this is reflected in our continued commitment to the voluntary substitution of illicit crops, despite successive breaches and contradictions of the national government in the implementation of the PNIS (voluntary crop substitution programme). According to the UN at least 42 other communities are in a similar position to Alto Mira and Frontera. Alto Mira and Frontera have an agreement with the government for voluntary crop substitution. But tension is high because of the interests of the various groups in the illicit economy. The Colombian Government is also under immense pressure from the USA to reduce coca hectares. But if Colombia is to establish sustainable peace it is essential that the agreements on drugs in the Peace Accord are fully implemented, and voluntary eradication is carried out. There are complexities in the Colombian context which make this approach essential. Not least that communities are in the midst of competing interests of illegal armed groups. 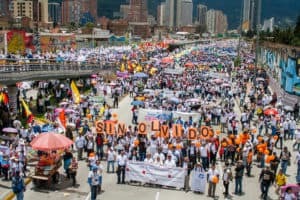 The civil society experts, appointed by the Colombian Government to sit on the Comisión Nacional de Garantías de Seguridad (National Security Guarantees Commission), which oversees the implementation of the Security Guarantees element of the Peace Accord, issued a public statement highlighting, that this crucial time for Colombia, as it seeks to build peace, and that the right to peaceful protest must be guaranteed by the State. • Fully investigate the actions of the Anti-narcotics and Riot (ESMAD) Police responsible for firing on a Humanitarian Verification Mission in Tumaco, and to suspend those responsible pending investigation. • Hold a special session of the National Commission on Security Guarantees, as a matter of urgency, headed by the President of the Republic. • Engage in a dialogue with communities in Alto Mira y Frontera, as well as, in other areas of the Country with peasant farmers and ethnic peoples on the processes of crop substitution, in to ensure full implement of the agreements made in the Final Peace Accord.